In pursuance of the primary objective of saving our great nation from total collapse, I, Major-General Muhammadu Buhari of the Nigerian army have, after due consultation amongst the services of the armed forces, been formally invested with the authority of the Head of the Federal Military Government and the Commander-in-Chief of the armed forces of the Federal Republic of Nigeria. It is with humility and a deep sense of responsibility that I accept this challenge and call to national duty. As you must have heard in the previous announcement, the constitution of the Federal Republic of Nigeria (1979) has been suspended, except those sections of it which are exempted in the constitution. The change became necessary in order to put an end to the serious economic predicament and the crisis of confidence now afflicting our nation. Consequently, the Nigerian armed forces have constituted themselves into a Federal Military Government comprising of a Supreme Military Council, a National Council of States, a Federal Executive Council at the centre and State Executive Councils to be presided over by military governors in each of the states of the federation. Members of these councils will be announced soon. The last Federal Military Government drew up a programme with the aim of handing over political power to the civilians in 1979. This programme as you all know, was implemented to the letter. The 1979 constitution was promulgated. However, in the case of Nigeria, its impact was aggravated by mismanagement. We believe the appropriate government agencies have good advice but the leadership disregarded their advice. The situation could have been avoided if the legislators were alive to their constitutional responsibilities; Instead, the legislators were preoccupied with determining their salary scales, fringe benefit and unnecessary foreign travels, et al, which took no account of the state of the economy and the welfare of the people they represented. As a result of our inability to cultivate financial discipline and prudent management of the economy, we have come to depend largely on internal and external borrowing to execute government projects with attendant domestic pressure and soaring external debts, thus aggravating the propensity of the outgoing civilian administration to mismanaged our financial resources. Nigeria was already condemned perpetually with the twin problem of heavy budget deficits and weak balance of payments position, with the prospect of building a virile and viable economy. Fellow Nigerians, this indeed is the moment of truth. My colleagues and I – the Supreme Military Council, must be frank enough to acknowledge the fact that at the moment, an accurate picture of the financial position is yet to be determined. We have no doubt that the situation is bad enough. In spite of all this, every effort will be made to ensure that the difficult and degrading conditions under which we are living are eliminated. Let no one however be deceived that workers who have not received their salaries in the past eight or so months will receive such salaries within today or tomorrow or that hospitals which have been without drugs for months will be provided with enough immediately. We are determined that with the help of God we shall do our best to settle genuine payments to which government is committed, including backlog of workers’ salaries after scrutiny. In view of the drought that affected most parts of the country, the federal government will, with the available resources, import food stuffs to supplement the shortfalls suffered in the last harvest. Our foreign policy will both be dynamic and realistic. Africa will of course continue to be the centre piece of our foreign policy. The morale and combat readiness of the armed forces will be given high priority. Officers and men with high personal and professional integrity will have nothing to fear. Fellow Nigerians, finally, we have dutifully intervened to save this nation from imminent collapse. We therefore expect all Nigerians, including those who participated directly or indirectly in bringing the nation to this present predicament, to cooperate with us. 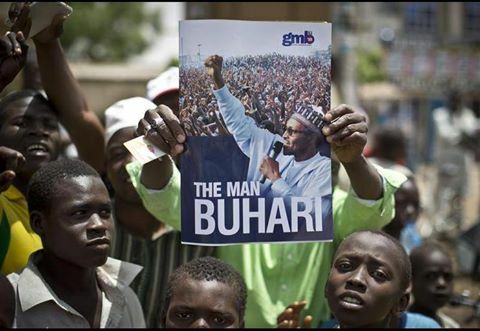 This generation of Nigerians, and indeed future generations, have no country other than Nigeria. We shall remain here and salvage it together.May God bless us all. Good morning. When in December 1983, the former military leadership, headed by Major-General Muhammadu Buhari, assumed the reins of government, its accession was heralded in the history of this country. With the nation at the mercy of political misdirection and on the brink of economic collapse, a new sense of hope was created in the minds of every Nigerian. Since January 1984, however, we have witnessed a systematic denigration of that hope. It was stated then that mismanagement of political leadership and a general deterioration in the standard of living, which had subjected the common man to intolerable suffering, were the reasons for the intervention. Nigerians have since then been under a regime that continued with those trends. Events today indicate that most of the reasons which justified the military takeover of government from the civilians still persist. The initial objectives were betrayed and fundamental changes do not appear on the horizon. Because the present state of uncertainty, suppression and stagnation resulted from the perpetration of a small group, the Nigerian Armed Forces could not as a part of that government be unfairly committed to take responsibility for failure. Our dedication to the cause of ensuring that our nation remains a united entity worthy of respect and capable of functioning as a viable and credible part of the international community dictated the need to arrest the situation. Let me at this point attempt to make you understand the premise upon which it became necessary to change the leadership. The principles of discussions, consultation and co-operation which should have guided decision-making process of the Supreme Military Council and the Federal Executive Council were disregarded soon after the government settled down in 1984. Where some of us thought it appropriate to give a little more time, anticipating a conducive atmosphere that would develop, in which affairs of state could be attended to with greater sense of responsibility, it became increasingly clear that such expectations could not be fulfilled. Regrettably, it turned out that Major-General Muhammadu Buhari was too rigid and uncompromising in his attitudes to issues of national significance. Efforts to make him understand that a diverse polity like Nigeria required recognition and appreciation of differences in both cultural and individual perceptions, only served to aggravate these attitudes. 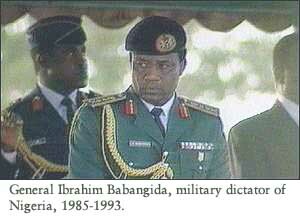 Major-General Tunde Idiagbon was similarly inclined in that respect. As Chief of Staff, Supreme Headquarters, he failed to exhibit the appropriate disposition demanded by his position. He arrogated to himself absolute knowledge of problems and solutions, and acted in accordance with what was convenient to him, using the machinery of government as his tool. A combination of these characteristics in the two most important persons holding the nation’s vital offices became impossible to content with. The situation was made worse by a number of other government functionaries and organisations, chief among which is the Nigerian Security Organisation (NSO). In fact, this body will be overhauled and re-organized. And so it came to be that the same government which received the tumultuous welcome now became alienated from the people. To prevent a complete erosion of our given mandate therefore, we had to act so that hope may be rebuilt. Let me now address your attention to the major issues that confront us, so that we may, as one people, chart a future direction for our dear country. We do not pretend to have all the answers to the questions which our present problems have put before our nation. We have come with the strongest determination to create an atmosphere in which positive efforts shall be given the necessary support for lasting solutions. For matters of the moment which require immediate resolutions, we intend to pursue a determined programme of action. Major issues falling into this category have been identified and decisions taken on what should be done. Firstly, the issue of political detainees or convicts of special military tribunals. The history of our nation had never recorded the degree of indiscipline and corruption as in the period between October 1979 and December 1983. While this government recognises the bitterness created by the irresponsible excesses of the politicians, we consider it unfortunate that methods of such nature as to cause more bitterness were applied to deal with past misdeeds. We must never allow ourselves to lose our sense of natural justice. The innocent cannot suffer the crimes of the guilty. The guilty should be punished only as a lesson for the future. In line with this government’s intention to uphold fundamental human rights, the issue of detainees will be looked into with despatch. As we do not intend to lead a country where individuals are under the fear of expressing themselves, the Public Officers Protection Against False Accusation Decree 4 of 1984 is hereby repealed. And finally, those who have been in detention under this decree are hereby unconditionally released. The responsibility of the media to disseminate information shall be exercised without undue hindrance. In that process, those responsible are expected to be forthright and to have the nation’s interest as their primary consideration. The issue of decrees has generated a lot of controversies. It is the intention of this government to review all other decrees. The last twenty months have not witnessed any significant changes in the national economy. Contrary to expectations, we have so far been subjected to a steady deterioration in the general standard of living; and intolerable suffering by the ordinary Nigerians have risen higher, scarcity of commodities has increased, hospitals still remain mere consulting clinics, while educational institutions are on the brink of decay. Unemployment has stretched to critical dimensions. Due to the stalemate, which arose in negotiation with the International Monetary Fund, the former government embarked on a series of counter-trade agreements. Under the counter-trade agreements, Nigerians were forced to buy goods and commodities at higher prices than obtained in the international market. The government intends to review the whole issue of counter-trade. A lot has been said and heard about our position with the International Monetary Fund. Although we formally applied to the fund in April 1983, no progress has as yet been made in the negotiation and a stalemate has existed for the last two years. We shall break the deadlock that frustrated the negotiations with a view to evaluating more objectively both the negative and positive implications of reaching a mutual agreement with the Fund. At all times in the course of discussions, our representatives will be guided by the feelings and aspirations of the Nigerian people. It is the view of this government that austerity without structural adjustment is not the solution to our economic predicament. The present situation whereby 44 per cent of our revenue earning is utilised to service debts is not realistic. To protect the danger this poses to the poor and the needy in our society, steps will be taken to ensure comprehensive strategy of economic reforms. 1. A decrease of our domestic production, while our population continues to increase. 2. Dependence on import for both consumer goods and raw materials for our industries. 3. A grossly unequal gap between the rich and the poor. 4. The large role played by the public sector in economic activity with hardly any concrete results to justify such a role. These are the problems we must confront. Nigeria’s foreign policy in the last 20 months has been characterised by inconsistency and incoherence. It has lacked the clarity to make us know where we stood on matters of international concern to enable other countries relate to us with seriousness. Our role as Africa’s spokesman has diminished because we have been unable to maintain the respect of African countries. The ousted military government conducted our external relations by a policy of retaliatory reactions. Nigeria became a country that has reacted to given situations, rather than taking the initiative as it should and always been done. More so, vengeful considerations must not be the basis of our diplomacy. African problems and their solutions should constitute the premise of our foreign policy. The realisation of the Organisation of African Unity of the Lagos Plan of Action for self-sufficiency and constructive co-operation in Africa shall be our primary pursuit. The Economic Community of West African States must be reborn with the view to achieving the objective of regional integration. The problems of drought-stricken areas of Africa will be given more attention and sympathy, and our best efforts will be made to assist in their rehabilitation within the limits of our resources. Our membership of the United Nations Organisation will be made more practical and meaningful. The call for a new International Economic Order which lost its momentum in the face of the debt crisis will be made once again. Nigeria hereby makes a renewed request to the Non-Aligned Movement to regroup and reinvigorate its determination to restructure the global economic system, while we appeal to the industrialized nations to positively consider the debt plight of the developing countries and assist in dealing with the dangers that face us. We shall remain members of the various multilateral institutions and inter-governmental organisations which we belong to and do what must be done to enhance the membership and participation within them. Fellow Nigerians, this country has had since independence a history mixed with turbulence and fortune. We have witnessed our rise to greatness, followed with a decline to the state of a bewildered nation. Our human potentials have been neglected, our natural resources put to waste. A phenomenon of constant insecurity and overbearing uncertainty has become characteristic of our national existence. My colleagues and I are determined to change the course of history. This government is determined to unite this country. We shall not allow anything to obstruct us. We recognise that a government, be it civilian or military, needs the consent of the people to govern if it is to reach its objective. We do not intend to rule by force. At the same time, we should not be expected to submit to unreasonable demands. Fundamental rights and civil liberties will be respected, but their exercise must not degenerate into irrational expression nor border on subversion. The War Against Indiscipline will continue, but this time, in the minds and conduct of Nigerians, and not by way of symbolism or money-spending campaigns. This government, on its part, will ensure that the leadership exhibits proper example. Criticisms of actions and decisions taken by us will be given necessary attention and where necessary changes made in accordance with what is expected of us. Let me reiterate what we said in 1984: This generation of Nigerians and indeed future generations have no other country but Nigeria. We must all stay and salvage it together. This time it shall be pursued with deeper commitment and genuine sincerity. There is a lot of work to be done by every single Nigerian. Let us all dedicate ourselves to the cause of building a strong, united and viable nation for the sake of our own lives and the benefits of posterity. Finally, I wish to commend the members of the Armed Forces and the Nigeria Police for their mature conduct during the change. I thank you all for your co-operation and understanding.